Micheal Jackson Aka The king of pop was one of the best selling musicians of all time. His thriller album is still the best selling record of all time, it sold over 50 million copies worldwide and spent 37 weeks at number one on the US Billboard charts. As well as having some of the most popular songs of all time under his belt, Micheal Jackson is also highly regarded as having some of the most influential and iconic music videos ever, the heavily produced videos were sometimes over 10 minutes in length and had a profound effect on pop culture in the 1980s with everyone wanting to adopt the iconic looks made famous by Micheal in the videos. Now you too can recreate some of Micheal's most recognised looks with our fantastic range of officially licensed Micheal Jackson fancy dress costumes. We've got everything from his mammoth musical career: Perhaps you fancy trying to recreate his spooky video for thriller in his iconic red jacket and trousers combo or maybe even transform yourself into the terrifying werewolf that he turns into. Maybe you fancy something a bit more dressy ? 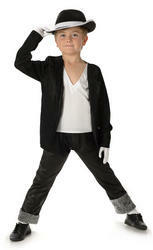 If so we have the fantastic sequin clad Billie Jean fancy dress costume, perfect for mooon walking in style. MJ's popularity knew no boundaries with People of all ages adoring the pop sensation and that is why we have Micheal Jackson fancy dress costumes for Men, Ladies and Children. So grab your glitter glove and head to the dance floor, you'll be thrilling your friends and fellow party goers in style thanks to this amazing range.